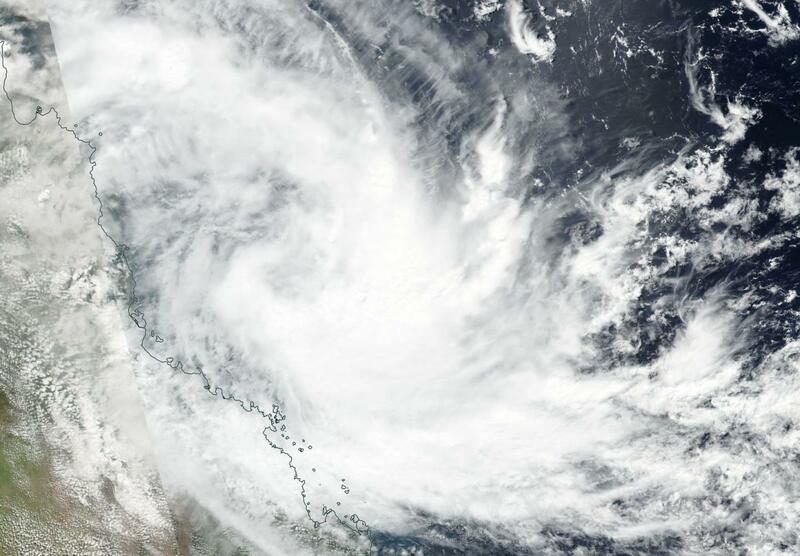 During the week of March 26 Tropical Cyclone Iris weakened to a low pressure area and since then it has been lingering off the coast of Queensland, Australia. On April 2, strengthened by the warm waters of the Coral Sea, Southern Pacific Ocean Iris re-generated into a tropical cyclone. NASA-NOAA's Suomi NPP satellite captured an image of the zombie storm after it was "re-born." On April 2 the Visible Infrared Imaging Radiometer Suite (VIIRS) instrument aboard NASA-NOAA's Suomi NPP satellite captured a true-color image of Iris. The VIIRS image showed the center of circulation surrounded by a thick band of thunderstorms wrapping from the northeast to the southwest and into the low-level center. True-color imagery is created by combining data from the three color channels on the VIIRS instrument sensitive to the red, green and blue (or RGB) wavelengths of light into one composite image. On April 2, the Australian Government Bureau of Meteorology (ABM), Queensland Tropical Cyclone Warning Centre posted a Tropical cyclone watch for tropical cyclone Iris. The Watch Zone runs from Ayr to St Lawrence, including Mackay and the Whitsunday Islands. On April 2 at 9:41 a.m. EDT (1341 UTC) ABM reported that Iris was a Category 1 storm with sustained winds near the center of 46.6 mph (75 kilometers per hour). Iris was centered near 17.2 degrees south latitude and 149.0 degrees east longitude. It's about 214 miles/345 kilometers east of Cairns and 202 miles/325 kilometers northeast of Townsville. Iris was moving to the south at 3.7 mph (6 kph). ABM said "Tropical cyclone Iris is expected to continue moving slowly to the south during Tuesday while continuing to intensify, before curving more to the southeast, parallel to the Queensland coast on Wednesday. At this stage, the cyclone is not expected to cross the Queensland coast, but may approach the coast close enough to produce significant impacts." For updated forecasts, watches and warnings, visit: http://www.bom.gov.au/cyclone/index.shtml.